Griffen is using Smore newsletters to spread the word online. What happens when you catch a leprechaun? 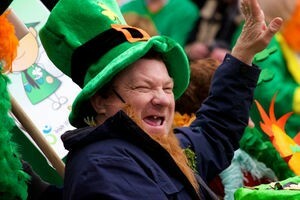 Leprechauns originate and live in Ireland(Mcdermott 2013). They are fairy shoe makers of ireland who only work on one shoe(Leprechauns 2014). There are many things the word leprechaun can come from but one suggestion was that it came from the irish word luprichaun(Aamoth 2010). 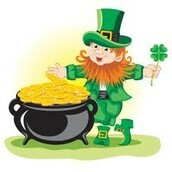 The leprechauns are tricksters who are the sons of an evil spirit(Aamoth 2010). 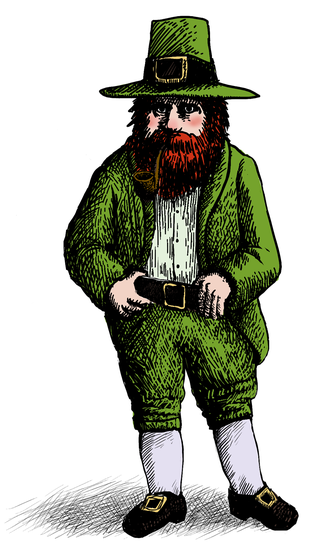 Leprechauns don't usually wear a hat, even though most people think they do it's just a sterotype, and they wear buckled shoes(Radford 2013). Many mythical creatures have a bunch of history behind them but leprechauns history isn't so much believed because only one third of the people of ireland believe in them(Leprecahuns 2014). There has been no evidence of spotting of the leprechaun but there has been stories. One story was about a girl who found a leprechaun and the leprechaun took her to his pot of gold and it was under a bush. The girl forgot a shovel but thankfully had a flag type thing in her pocket and marked the bush and then let the leprechaun go and she went to go get a shovel. When the girl got back every single bush got marked by the same flag she had (Radford 2013).There were many more stories exactly like this one but with males but it was still the same plot about how leprechauns are tricksters. I think that you will never catch a leprechaun cause they're fake. I think they're fake because there has been no actual evidence they exist(Mcdermott 2013). I also think they're a hoax because only one third of the irish population believe in them, 34%(Leprechauns 2014). Also the stories just seem made up because how could one person tie a bunch of bushes at once before the girl gets back(Radford 2013). They're a hoax because there has been no evidence found, the stories seem fake, and only one third of the irish population belive in them. Aamoth, Doug, and Doug Aamoth. "Cryptids: Leprechauns | TIME.com." Time. Time, 2010. Web. 10 May 2016. "Leprechaun." - New World Encyclopedia. N.p., 30 July 2014. Web. 10 May 2016. Mcdermott, Alicia. "Leprechauns: At the End of the Rainbow Lies Richness for Irish Folklore." Ancient Origins. N.p., 2014. Web. 10 May 2016. Radford, Benjamin. "Leprechauns: Facts About the Irish Trickster Fairy." LiveScience. TechMedia Network, 20 June 2013. Web. 10 May 2016.